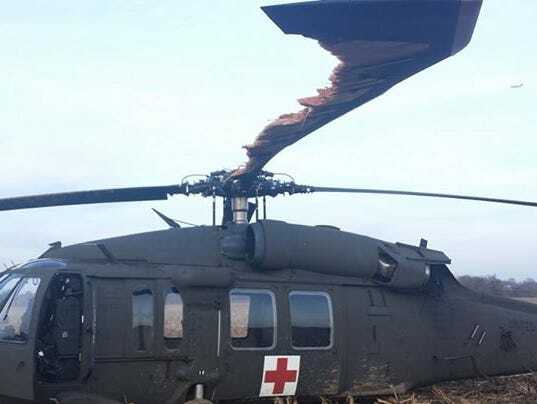 Columbia, SC (WLTX) - The South Carolina National Guard says a Blackhawk helicopter will remain in a field off Interstate 77 for now after it had to make a precautionary landing. The UH-60 Blackhawk had to land at the location, which is near the Cayce Water Treatment Facility, at 4:18 p.m. Wednesday after experiencing a main rotor blade malfunction. The chopper is assigned to the 1-111th General Aviation Support Battalion. The guard says the helicopter will remain at the site until it's released by an Accident Investigation Board. Colonel James Barkley, the South Carolina State Aviation Officer, said this is the first time they've experienced an issue with the Blackhawk. "The aircrew training and stringent standards resulted in an incredible job performed by these S.C. Army National Guard aviators. Their experience operating in a combat environment translates back to their aviation roles stateside," said Barkley. They performed in an exemplary and outstanding job. At the end of the day, they went home to their families unscathed." "The successful emergency landing of our UH-60 Black Hawk speaks to the professionalism and skill of the aircrews in the S.C. Army National Guard," said Maj. Gen. Robert Livingston, the adjutant general for South Carolina. The guard is determining their options for moving the aircraft. Last edited by SansAnhedral; 5th Dec 2014 at 18:04. Must have been some pretty unbelievable vibrations! Amazing that they could make an emergency landing in that sort of state. Also deserves a . Either that or the famed helicopter shark finally made a kill. A pilot I fly with who also supports that Battalion sent me the pics after it happened - unbelievable. At 6000' they entered an auto and contacted approach to declare an emergency. Approach told them to squawk but the vibration was so severe that they could not get hands on to the transponder and were being thrown around the cockpit. Kudos to the crew for getting her down and hats off to Sikorsky for keeping it together. Wow! That's gotta be about as damaged as 60 blade can get and still fly. It's nice to be good and it's even better to be lucky too. Brings up some fine memories of a blade change we had to do on an A model in a field in rural West Germany back in 1987. The middle of winter as I recall. While it was often possible to make a temporary repair with speed tape after the occasional tree trimming incident, field replacement of the blade was necessary if the damage was anything more that minor. No doubt about this one! Heckuva good outcome. Pilots and Sikorsky engineers did well. well there IS an argument that some Sikorsky engineers didn't 'do well' as the blade fell apart! !, not so much for the rest of the aircraft. congrats to the crew though, couldnt have been much lift off that blade. Well it could be said the entire crew..Won the lottery, perhaps they should now try the next ticket sale. That must be one hell of a strong Heli..! Think about being at 6,000 feet when it happened and how long it took to land. It seemed the older I got....the lower I flew for some unfathomable reason. On Aug 9, 1976 at about 2315 hrs, an Army evaluation crew* with a 101st Airborne squad/weapons aboard were flying low level at 145 KIAS when a similar looking blade cover problem took place. * Boeing and SA both trained 10 operational pilots in their respective aircraft for the op eval at FT Campbell. They were chosen to represent the range of experience and rank within a unit. Serendipity stepped in here, and just a few moments prior to the event, one of the brand new aviators handed over the controls to one of the most experienced. The cause of the cover peel was determined fairly quickly. There are three wraps of skin bonded on at either 30 or 45 degree angles ( can't recall ). At the outboard edge of the blade, the skins were cut straight along the chordwise edge. Evidence at that edge indicated that the bond was not perfect, air got into the open edge and an unpeeling proceeded. The fix was to eliminate the open edge of the skins by changing the design to provide for the upper skin to wrap around the others at this edge ( i.e., tuck it around and in ). Looking into the history of this blade and inspecting it is no doubt job one in Stratford at the moment. The reason I know the details as to this event was that shortly before midnight my phone rang and a few hours later a corporate aircraft departed for Ft Campbell with a small team of the UTTAS senior talent. The young aviators doing the flying were faced with very very high 1P vibratory excitation ( remember, this was at low level BEFORE NVG ) and decided to slow it up and land. They did that and made a rather excellent vertical landing thru the FT Campbell pine trees, trimming quite a few**. There was one injury: upon landing the squad leader gave it a follow me order and stepped out, travelling about 1-2 feet before getting a bloody nose on a 5 inch pine tree the trunk of which tree was right outside the door. ** You could see how vertical the landing was by looking at a tree just beside the tail rotor. 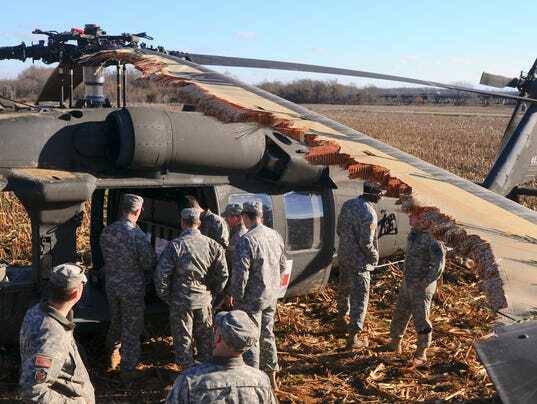 That tree showed damage from up high to a point even with the tail rotor as it was after landing. So the tail rotor just chipped away at this one tree trunk as they descended. I have a few pictures but they are large and probably too big for this site. Send me a PM with your email and I will get them to you. On Aug 10th we looked over the aircraft and finding it just needed blades, the Army brought in chainsaws, and cleared a bit larger LZ, so to speak. Put a new set of mains and tail paddles on, and the next morning an Army crew flew it out and back into the competition. BTW, the UTTAS came with a portable maintenance crane which hooked onto the side cabin floor and the Army troops assigned to maintain the ships for the eval got some realistic practice in changing out the blades. Ah, the true story behind the "lumberhawk" incident. Is it true that this exact airframe (73-21650) was the accident aircraft in the Stratford crash in 1978? It was either 650 or 651. 652 went to Ft Rucker as a flying trainer for the Aviation School Maintenance Dept. It probably was 650, now that I think of it, because it was best instrumented for structural/vibration work and that was what we were going to do with it. That day of that crash, it was to do a demo for a senior DOD visitor, after which it was to be ferried to the West Palm flight test facility. Thanks to John Eacott for sizing the pictures. First picture is typical of the trees that were trimmed, and is also the culprit causing the only injury: the tree that the squad leader ran into egressing into the night. Next shot is the portable maintenance crane being used to R/R the main blades. You can see the type trees that were hit by the blades during descent. 3rd shot is the ship as it looked in the morning after the landing. The greater amount of blade core that is missing on the South Carolina ship compared to this one is obvoius. I remember that the amount of core that was missing on this blade was 10-12 feet,and that was all out toward the tip cap. Hard to see that in this picture. The last photo is the Army crew flying the ship out, after the young troopers with the chainsaws had done their work. Getting the machine back to the cornfield used by the 101st for the evaluation and ready for missions so quickly surprised a few people, but probably shouldn't have. The design spec requirements for that aircraft, in particular the basic structural standards, the crashworthy requirements and the ballistic survivability requirements blended to make a very tough machine. JohnDixon: Sounds like a story out of "Chicken Hawk"
* ARA. Aerial Rocket Artillery. UH-1B with a 6 x 4 tube 2.75 rocket pod on each side. With the larger warheads, each one was about the same as a 105mm wowitzer round in terms of effect. There were also flechette rounds. After the blade peel landing, Army regulations required that the accident pilots get a checkride before return to flight duties. Army didn't yet own any IP's etc, so I got the task. Like I said, everything was being run like a war, so up we went in the other SA UTTAS at around midnight, the following night. The two pilots were just fine but that ship had way too much 4P vibration, and upon return, I wrote it up and went over the machine with a SA crewchief who was there to assist the 101st maintenance if needed. Not finding anything major using flashlights, I told them we would give it a good look in the morning. Col. Perry comes up and says " Are you grounding this aircraft? " I told him " No, but we just had one event and it seems prudent to make absolutely certain the other ship is 100%. He says: " OK, you grounded the aircraft ". We went round and round until I said something to the effect of " Fine, have it your way ". It ws 2 AM by then and I really didn't give a you know what. Bright and early we went out to the cornfield and found that the nose absorber bushings were shot and started replacing them. Field phone rings and Bill Paul, SA Engr VP is on the line. I could hear Bill holding the phone 3 ft from my ear. Was he upset? The message I was listening to started out with " John, the name of the company is not The Dixson Aircraft Corporation, it is Sikorsky Aircraft...." and went downhill from there. Anyway, by the time he was finished talking the absorber was fixed and bottoned up and the ship was ready to fly. Teaser: Ron Perry was running Cobra Hall ( AH-1 school )at Ft Stewart in 1971 when we took the S-67 around the USA on tour and was the second guy I rolled that machine with. Ought to add that one might get the wrong impression from this short anecdote. Over many years following, I counted myself very lucky to be working for Bill Paul and working with Ron Perry. Still think that Ron Perry would have made a terrific General. Could this very sad looking r/b have been held together by the leading edge( is it all one piece) plus the Berp Plate, so that even though under extremis of Vibes it held it together long enough so the pilot could get down ?